Purchase the Becalm Baby Teething Mitten – and a Dribble and Chew Teething Bib and Save $6.00!! (Don’t forget your 10% discount code that you can get from the red tab below). Sometimes the simplest ideas are the best. 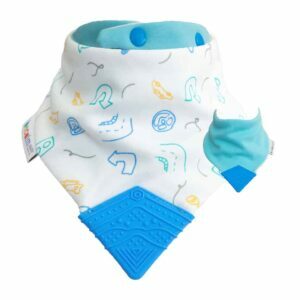 A dribble bib with a teether attached. Grab a Becalm Baby® Teething Mitt – and Dribble and Chew Teething Bib Combo and Save! Your baby will love the Becalm ® Teething Mitt ! It’s cute, innovative and fits over baby’s hand allowing them to self-soothe their itchy, irritated gums. An Easy Reach Teether. The mitten has an adjustable velcro strap to ensure that it stays on with a comfortable fit. Cloud shaped teether made from 100% food grade silicone, expertly designed so is the perfect shape for little mouths. Ideally suitable for babies between 3 and 12 months old. The Becalm ® Teething Mitt has exceeded all safety testing AS/NZS 8124. Can be washed to 30 degrees and comes with a wash/travel bag.